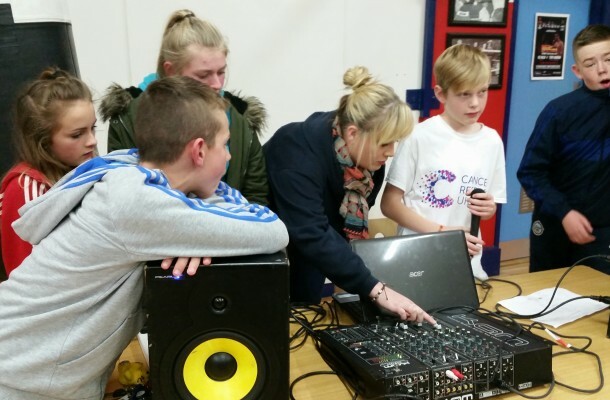 Young people who attend our Positive Futures programme on Saturday evenings, had the opportunity to try their hand at a 2 week DJ workshop facilitated by Cool FM DJ Mairead Campbell. The young people had the chance to design their own radio show, selecting a song playlist as well as coming up with topics to discuss, going out to a live radio audience. The workshop is designed to engage young people to decide upon specific issues which affect them directly on a daily basis within their local community. Well done to everyone who took part, and we hopefully will have some budding DJ’s making an appearance soon on a radio station near you!! !